Daisy’s Bakery of Clifton, N.J., is recalling 4-oz. 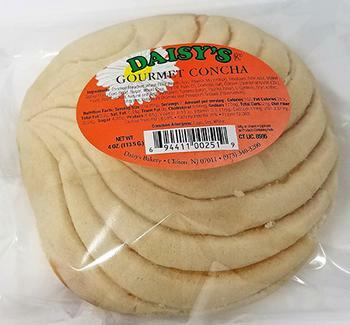 packages of Gourmet Concha that may contain milk, an allergen not declared on the label. The recalled product is white, round with a seashell shape stamped on top of a 4-oz.e sweet bread, clear plastic package marked with the lot numbers 441, 442, 443, 444, 445, 446, 447, 448, 449, 450, 451, 452, 453, 454, 455, 456, 457, 458, 459, 460, 461, 462, 463, 464, 465, 466, 467, 468, 469, 470 and 471 marked in yellow or white numbers on the back of the package. It was sold in retail stores through direct delivery in New York, New Jersey, Florida, Illinois and North Carolina. Consumers with questions may contact Daisy’s Bakery at 973-340-3200 Monday- Friday, 7am- 5pm.